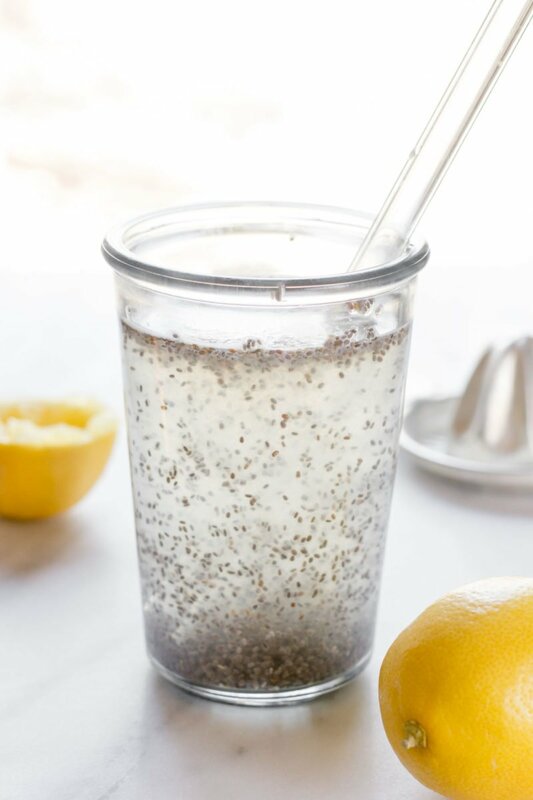 This lemon, chia, and apple cider vinegar drink is how I start each morning! My morning elixir has lots of health benefits, but most important to me, it gets me in a healthy mindset for the day. I’m about to get real hippie-dippie, crunchy granola on you. So those of you who maybe aren’t on the natural medicine bandwagon, consider yourself warned, k? I try to live my life by the middle path, and that applies to my health and medical care, too. I’m not even a little bit against Western medicine (shout out to the chemo that knocked out my mom’s breast cancer 20 years ago), but I do think part of our responsibility as humans on this planet and citizens of our society is to try to do the best we can to take care of ourselves without always relying on a prescription or a surgery. I believe natural remedies and medical remedies should (and can) work hand in hand. That’s why I try to eat healthy. I drink lots of water. I go on lots of walks. I meditate. I’m trying to cut back on the stress in my life. And I make sure to really evaluate when if I need to take medicine or not (and if I need to, I do it—hellllooo Excedrin Migraine, never stop being awesome). Now, there are a lot of drug commercials out there with smiling happy people that will try to convince you that you are powerless when it comes to your health. Like there is no way you’ll ever feel better unless you ask your doctor about this specific drug. And for some people, those drugs are really necessary. And if you’ve found something that works well for you? Awesome. I’m super stoked for you! But I do, in general, wish that our first instinct when something feels off with our bodies or minds is to look to the decisions that we make on a daily basis—specifically our food choices. Am I saying that eating some chia seeds and drinking a kale smoothie is the same as a miracle drug? No. But I’m saying it can’t hurt. And sometimes, it might even really help. And that’s where My Morning Elixir comes in. I wake up each morning, stumble downstairs, and make myself a cup of lemon juice, apple cider vinegar, chia seeds, and warm water. And it’s changed my life. I’m not going to claim that this drink is going to make you run marathons until you’re 120 years old, but I will tell you how I feel when I make sure to drink this drink each day. Is this anecdotal evidence? Totally. But the great thing about using food as medicine is that anecdotal evidence is all you need. There is nothing to lose (except maybe a few bucks on the ingredients if they aren’t things you have kicking around). If drinking this makes you feel nothing, oh well. But if drinking it makes you feel as great as it makes me feel, well isn’t that a win? Helped my chronic heartburn. I had a rough pregnancy with a lot of vomiting—my esophagus hasn’t healed from it (and I’m not sure it ever will), and I get a lot of heartburn. On days when I drink this drink? No heartburn. When I skip it? Holy heartburn hotel. Seems counterintuitive considering two of the ingredients are acid, doesn’t it? Many folks believe that heartburn and acid reflux are actually caused by your stomach having too little acid instead of having too much. Lots more info here. Kickstarts my metabolism. When I skip my morning elixir, I can go hours without feeling hungry. Like full on skip breakfast, forget to eat, bad for you kind of un-hungry. When I get up in the morning and drink this? Within 15 minutes or so, my tummy’s all like “Alright, kid. That was awesome. Lets have more healthy food!” More about the metabolism boost here. My skin is awesomer. I’ve never had great skin, not bad, but not the glowing, fresh, healthy skin you see from truly healthy folks. It never bugged me until I started to show some signs of aging. The more wrinkles and grey hair I got, the more I wanted my skin to feel healthy. It’s my subtle way of saying to the world, “Hey, I may be getting older, but I’m still healthy and bonkers awesome.” When I drink this stuff? My skin actually has a glow to it. I’m not going to be on the cover of any magazine anytime soon, but I can see and feel the difference. And that’s all that matters. Gets me in a healthy mindset. This is my favorite benefit! This is all psychosomatic, and that’s why it’s such a huge win. When I get up in the morning and make time to make my elixir and drink it, it’s like a switch flips in my brain. Today will be a healthy day. Because I drank my morning elixir. When I start the day with a healthy decision, it makes it easier to make more healthy decisions. Health begets health. Even if you don’t want to do the full elixir, just getting up and drinking a glass of water in the morning will give you the same mind trick! 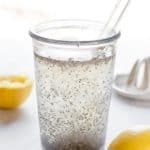 Now, there are a ton of other benefits listed out there if you just Google “benefits of lemon water” or “benefits of apple cider vinegar” or “benefits of chia seeds”. But that list up there is what I really notice from drinking this personally. And those changes are impactful enough for me, that I want to share my morning elixir with you! Apple Cider Vinegar: You’re looking for raw, unfiltered apple cider vinegar. I use Bragg’s because it’s readily available—they sell it at my regular grocery store in the salad dressing/vinegar aisle. You want to avoid using the regular apple cider vinegar that has been filtered and pasteurized (the clear stuff). The healthy enzymes and bacteria from fermentation are good for you, and filtering and pasteurizing the vinegar removes those. Lemons: I choose to use organic lemons, because I figure that if I’m drinking something for my health, avoiding as many pesticides as possible is a good idea. I use half of a lemon in the morning in my elixir, and then I usually squeeze the other have over a salad at lunch. Chia Seeds: One of the great things about chia seeds being so popular—you can get them almost anywhere now! You want whole chia seeds, and either white or black will work. Water: If you’re really anti-added chemicals, you’ll want to use purified or filtered water. I personally just use warm tap water. There are lots of different articles out there about the temperature of water you should drink, and it seem there are advantages and disadvantages to just about every temp range. I personally use warm water, because I’m almost always chilled when I get out of warm bed and head to the cold kitchen! Oh, and a note about taste. This is definitely an acquired taste. If you often drink kombucha, you probably won’t mind the tart flavor of the drink, but if you don’t, it might take some getting used to. When I first started drinking it, I’d add about a teaspoon of raw local honey (lots of health benefits to that, too! ), and then slowly stepped the honey down. Now I drink it without sweetener, and I love it. To your health, my friends! Mix all the ingredients together. Let rest for 5-10 minutes, stirring occasionally, or until the chia seeds have formed a gel. Drink up! Oooh! 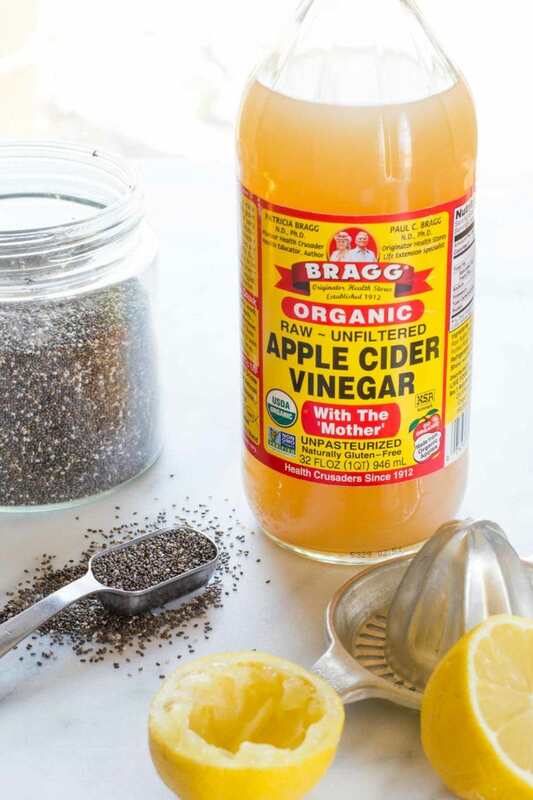 What do you put in your ACV vinegar? Inquiring minds want to know! I like to mix half water, half apple juice or cider with a capful or two of ACV. I also drink the It Works brand Greens powder sometimes and use the same water/apple juice mix and add a scoop or two of Greens powder. I like your addition of chia seeds!! Will have to add that to my mix sometimes, too! Just started the lemon + ACV combo last week! I’ll have to start adding in some chia seeds and really make something amazing! Thanks for sharing! I’m assuming that’s 1 1/2 CUPS of water? Thanks for this motivation! Im a big fan of acid fighting acid. I eat a grapefruit when I have heartburn and 99% of the time it stops it. OOOOH! I love grapefruit, and that sounds like a mighty tasty remedy! Hi Cassie. I found your blog around Christmas (don’t remember how) and read the annual report. 2 thumbs up. I just wanted to say I agree with you on everything in this post. My husband drinks warm lemon water every morning. I have a recipe on my blog but I drink it on and off. I should start tomorrow forever. I agree about organic lemons. We try organic as much as we can. I also make my own anti-inflammatory tea. I’d love to hear more about your anti-inflammatory tea! We’re trying to shift our diet to be more and more anti-inflammatory, so any tips or recipes would be greatly appreciate! I love that—”feel good moment”—that’s totally what it is! Starting off your day by doing something to take care of yourself is HUGE. Love this idea. Definitely going to try it because I’ve been suffering from acid reflux too. Random (kinda stupid) question….do you chew up the chia seeds or just drink them whole? Thanks! Now, I’m curious whether you need to wait a specific time until you eat. I already have to wait half an hour before I eat/drink anything else than water because I have to take a hormon supplement . sold! you had me at heartburn — what is it about being pregnant that does that?! I have been still struggling to get over it — and girlfriend is already 9 months old! For me, I think it’s leftover damage from the months and months and months of tossing my cookies everyday! I drink a combo of ACV, lemon juice and chia seeds every morning too. Although I tend to have it after my first coffee haha Still does give me a bunch of benefits though so still a better choice then not having it. A word to the wise about Chia. Chia is bulk in the intestine. If you aren’t careful and you have a gut problem that involves frequent blockages or a stenosis (narrow area), you’ll want to be cautious with the Chia until you know how your gut will react. I’m speaking from experience with this. Chia is a great food, I’m not saying it isn’, but some of us have to beware. Hi Cassie! I’m glad I came across this post, and I’m definitely going to try this recipe. I keep hearing about the benefits of ACV and lemon juice. I have all the ingredients already in my kitchen, so there’s no excuse. Thanks for the info. This one’s getting pinned to my recipes board! I like to muddle in 6 raspberries with my lemon and acv. I’m definitely adding chia tomorrow morning! Will this be helpful for Weight Loss. Does this drink help with constipation my sister has been battling that for a long time? Every morning I take two tablespoons of chia seeds mixed with 1 cup of water, and I can say it improves my bowel movement. Do remember to drink plenty of water for the rest of the day. so my drink is Water, Acv, chia powder and raw honey. Yummy!! Hi Charlie: I can’t give individual dietary advice—you’ll have to chat with your health care professional for that. Good luck with knee replacement! Do you drink this before you eat or drink anything else? Or whenever? Also could I drink this before bed like some of the health sites say to do, acv before bed and first thing in the a.m. ? I recently started getting kidney stones, as in the past year. And I can tell you this drink as helped me to get rid of them and to keep them at bay! Thank you so much. I really can’t take most pain meds they make me very sleepy I have two small children and work in a kitchen as a chef so being very sleepy is a no go at all times. Does this drink help you loose weight in any way some people say it does but i wanted to know your experiences. Sorry, I can’t give individual dietary advice—you’ll have to chat with your health care professional for that. Could I soak the seeds the night before and mix the gel and seeds with the rest of ingredients the next morning? Sure could! I’d just keep it all in the fridge, just to prevent the seeds from sprouting. 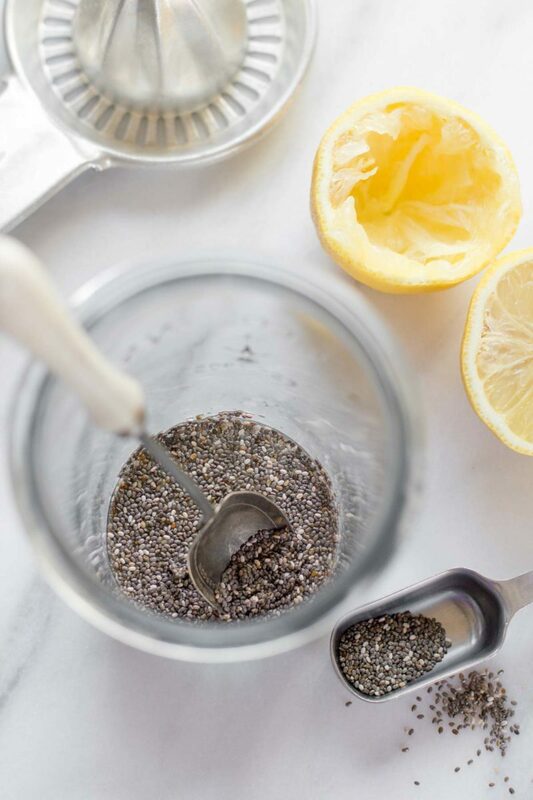 Can you grind up the chia seeds first before you put in water or blend all ingredients and then drink it? TIA. 1. I made this drink this morning and the seeds bunched up. Any tips to prevent that? 2. I do take a thyroid pill in the morning (directed: 30 min before eating) does anyone else with these restrictions take your pill with this drink? Christa- my gmas doctor told her water and only water for her thyroid meds. Not coffee (which is what she was doing) and not with her b-12 vitamin (again, like she was doing). I would err on the side of caution and take it as prescribed, fix your chia drink, and it will be ready for you once your allotted time has expired! Can you have a cup of coffee after having this drink? I know probably not back to back but if you wait awile after you eat breakfast ? What a great idea to use both, lemon and apple cider in combination. I am a big fan of lemon water in the morning for years. Thanks, Cassie! I’m allergic to ACV. Do you think this would work without it? This is essentially exactly how I drink my ACV, the only difference is that I add a bit of honey. What can I say, I have a sweet tooth. I don’t recommend/use this drink for weight loss purposes (it most definitely shouldn’t be used as a meal replacement). I drink it first thing in the morning, and you can drink as much as you want throughout the day!